Some consider the urban gardening phenomenon a continuation of peasant traditions, while others would rather trace its origins back to the rural properties of the old gentry. 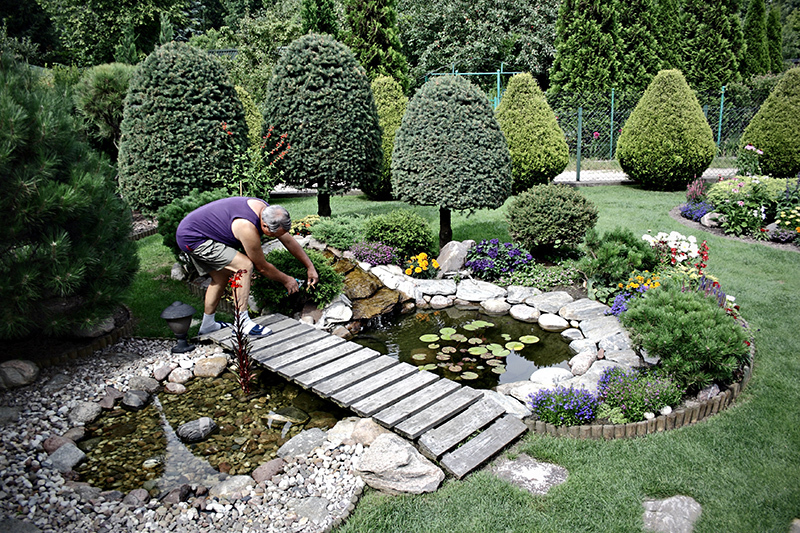 Either way, ‘działkowanie’ – the art of cultivating and relaxing on a small piece of land – is a national pastime. 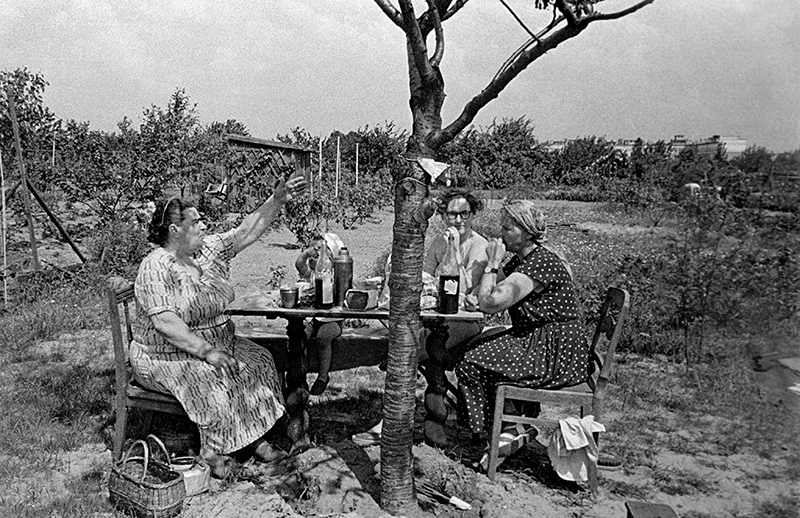 Culture.pl looks into how Poland's love of allotments began and where it might be heading. The word działka, which literally means an allotment, has come to signify the very much sought after small pieces of land with no permanent construction or residency rights – the somewhat cute sound of the word in Polish is almost evocative of a diminutive, even it isn’t one formally. The numbers are impressive: the działka garden collective lists almost one million used allotments, which are usually used by entire families. If we also add suburban villas to that list, it would probably give us another million. At least one in every ten families chooses weeding flower beds and barbecuing in the shade of a bower as their way of relaxing. We have traced the history of this phenomenon. With time, private gardens were also made available to the broader public, as people were beginning to suffer from the increasing degradation of the urban landscape in the aftermath of the abrupt industrial revolution. Multiple rows of apartment buildings, dark inner courtyards, crowded rooms, and horrible conditions were all standard in working-class settlements of the period. At the turn of the 19th and 20th centuries, urban greenery planning underwent a revolution. In his book entitled To-Morrow: A Peaceful Path to Real Reform from 1898, Sir Ebenezer Howard demonstrated his theory of the garden-city. Low-rise buildings, great infrastructure, abundant nature, close proximity of important offices – the perfect combinations of the best of both cities and small villages. The suburban area of Podkowa Leśna near Warsaw or Giszowiec near Katowice are two exemplary realisations of the concept. It was during this time that societies for the beautification of cities were founded, and the creation of urban green areas was to be one of their tasks. Działka gardens created on allotted pieces of land within the city are the fruit of the same idea. The very first garden collective was created in Grudziądz in 1899. It was named ‘Solar Baths’, and still exists today. The name of the collective derives from the medicinal methods propagated by its founder, Doctor Jan Jalkowski. Members of the Society for a Natural Lifestyle which he founded used to ‘engage themselves, half-naked, in gymnastic exercise, training, relaxation or sunbathing, in baths filled especially for this occasion with sun-warmed peaty mud,’ according to the gardens’ old chronicle. Ms. Praczkówna was the first to create more than fifty of these [gardens] in Warsaw in the year 1907, accompanied by some of her female friends, and in order to achieve this goal she had requested a few plots of wasteland. In 1908 there were already a few hundred of these gardens, because people started to support this good-willed endeavour, as they understood its extraordinary importance. Because the aim here is for the worker to be granted a possibility of enjoying not only fresh air, but also the feeling that he can also own something, to add onto his health as well as the health of his family, to facilitate bringing up children not just inside a stuffy and tight room or on the messy patio of a house, which is most frequently an elementary crime school, but in some better conditions. Finally, the view is such that the labourer’s work and that of his family could serve the feed and sustain the whole lot. This last need was provided for by the gardens especially during the periods of great nutritional shortages of the First World War. Paradoxically, the war became an impulse for the gardens’ development – suburban wastelands were very quickly adapted for victualling purposes. In Congress Poland, the phenomenon was popular in the most industrialised towns. In Galicia, there were almost no działka gardens at all, but this partitioned area could boast what was called the jordanowskie gardens. Doctor Henryk Jordan from Kraków came up with the initiative of creating special city gardens for sports and leisure, in order to ensure better health for local youth. 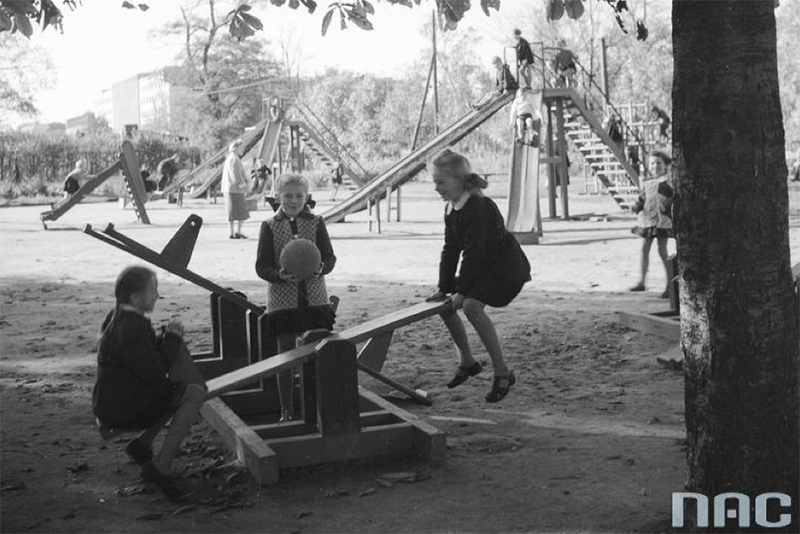 Today, Polish people tend to associate Jordanki with children's’ playgrounds, but their original versions were something much more grand. Jordan’s Park in Kraków had a gymnastics pavilion, a sleigh racing track, and educational area, and twelve different sports fields, including the first documented football field on Polish territory, a cricket field, as well as an area for walking on stilts. The gardens are a school of social solidarity, the działka owners share a common idea, they live in the best possible harmony, free of any status prejudices. A person enjoying their działka sees the merciless laws of evolution that prevail in nature, thus obtaining the clarity of judgement on all social issues, and he moreover becomes impermeable to any revolutionary doctrines, which are created in most cases by people who do not come into contact with nature. A man who earns just an average salary can have his own vegetables, his own flowers, his own barrow, his own leisure, his own Skaryszewski Park, his own Łazienki Park. Let’s all enrol at the Society for Family Gardens (…). God bless the new society. The Primate of Poland, August Hlond, gave his official blessing, and he was enthusiastic about the idea that ‘the worker and the townsman also lovingly cultivate a piece of their motherland, in accordance with the Piast tradition’. In 1936, a special anthem for działka owners was written by Zofia Drwęcka-Doeringowa. Its was titled Zielona Rzeczpospolita, which means Green Republic. In the Second Polish Republic, the gardening movement was not only created by Poles. The Zionist organisations called He-Chaluc (meaning pioneer in Hebrew) as also especially active in this regard, it created collective schooling groups called hachszary. Young Jews learned farming and gardening before setting out to live in the Palestinian kibbutz. The most impressive farm was created in the district of Grochów in Warsaw. Pioneers who cultivated that garden even succeeded in growing the same kind of reeds as in Palestine. The development of gardens in the inter-war period was significantly stimulated by one legal act – the official introduction of holiday leave in 1922. Tourism flourished, but mostly among the rich. A tiny patch of land close to one’s home was the ideal solution for an inexpensive holiday. But the division of land didn’t have an even tempo, and there was not enough land for all those interested. That is why on work-free days, many suburban holiday villages were incredibly crowded. 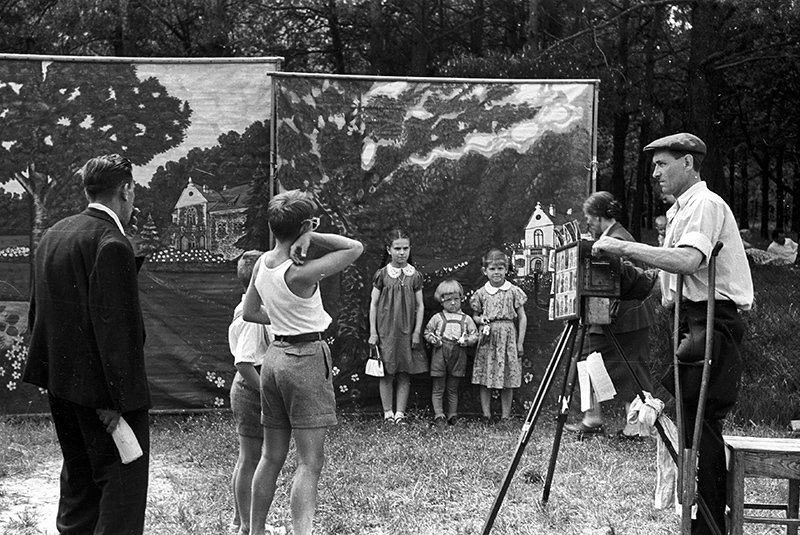 They were covered with ‘green rooms and little tables’, as people monikered picnic blankets stretched out on the grass, with various drinks and snacks. 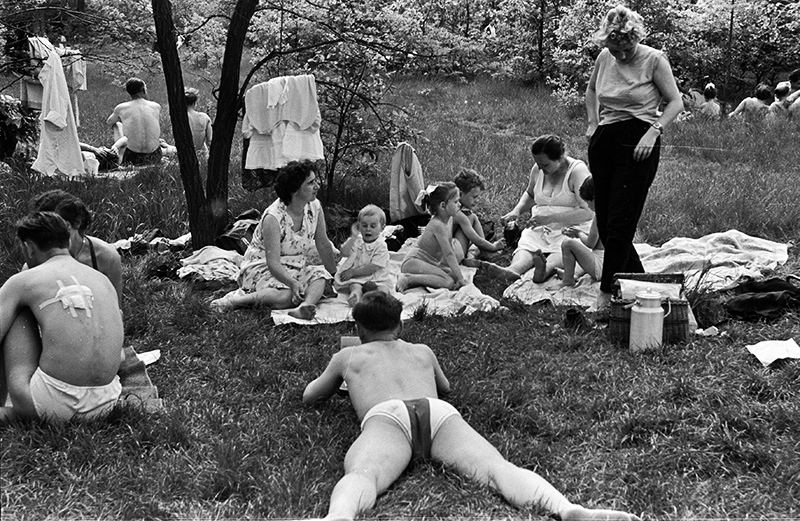 To date, dwellers of Warsaw reminisce about the ferry to Młociny, Easter holidays spent in Bielany, and escapades on the Świder river. After the war, the authorities came up with a slogan: ‘a działka garden for every workers’ family’. Pre-war allotments were restored, and new settlers of the Western Lands received numerous previously German gardens. On the hand, the działka activists managed to realise the post-war postulate, and their działki were considered a public utility. On the other hand the organisations lost their autonomy and power over them was taken over by a centralised system of workers’ unions. A działka garden was granted by the working place, on the basis of ‘good conduct’. A new style of social life is being created, one which is prettier and more free, friendly gatherings at the działka are becoming more and more popular, accompanied by a salad from one’s own vegetables or a plate of aromatic wild strawberries. 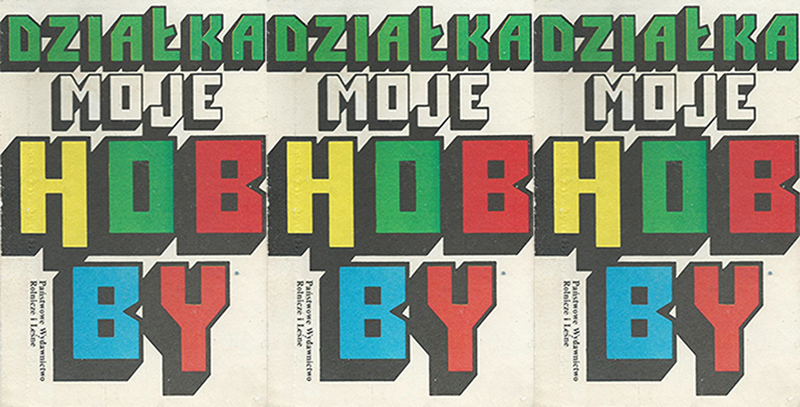 A new quality inscribed itself into the rhythm of the Polish city – an escapade onto the działka garden. Some have it already, others want it. Is it the relaxation? The comparison with some constructions sites and offices may put these gardens in a negative light – here, one works really hard. (…) Is it worth having a działka garden? The arguments are in the baskets. Do the działka gardens add on an aesthetic value to the cities? It’s not always the case, because the constructions raised there often resemble the kinds of slums that stick to the great metropolis of the south. For years, the bowers were made with whatever was at hand. Anthropologist Magdalena Zych wrote, that one could recognise where the owner worked by examining what his bower was made of. Some examples of used materials include pieces of steel sheets, post-construction wood, elevator doors, or a kiosk hut. Only the lucky few could set up pre-fabricated huts from the Stolbud company. But the działka owner’s ethos was never about money, but rather resourcefulness and wit. The real land-rush began after the transformation. Research conducted by the Polish Academy of Sciences shows that during the past 25 years, one in every four inhabitants of the countryside gave a piece of his land to summer visitors. In the 90s, new phenomena were added onto the ‘sport’ – barbecues, plastic swimming pools, warning signs against aggressive dogs, and garden gnomes. The nutritional function began to give way to the recreational function of the gardens. Society getting richer brought in new architectural forms as well, such as the villa, manor, and Scandinavian styles, as well as pre-designed projects from supermarkets. In 2005, the ‘workers’ gardens were officially re-named ‘family’ gardens. In 2012, a huge argument related to their status spread across all of Poland. The law effective at the time was considered unconstitutional. The process of reclaiming private property after the political transformation of Poland also became the działka owners’ nightmare, especially whenever their piece of land was located on grounds which had been turned into national property during Bierut’s leadership. Some argued that it’s merely a post-communist museum, and that the city is not the countryside and attractive grounds in centrally located territories should not be wasted. Others underscored the social and ecological values of these pieces of land, and warned that real estate developers will be the only ones benefiting from their dissolution. Desperate garden owners filed in petitions, put up flags on their bowers and even wrote pleading poems. That’s it for the history and politics, and to wrap up, let’s take a look at the cultural significance of the phenomenon today. For some, the działka garden is an hermitage, and meticulous, solitary gardening the best way to relax. 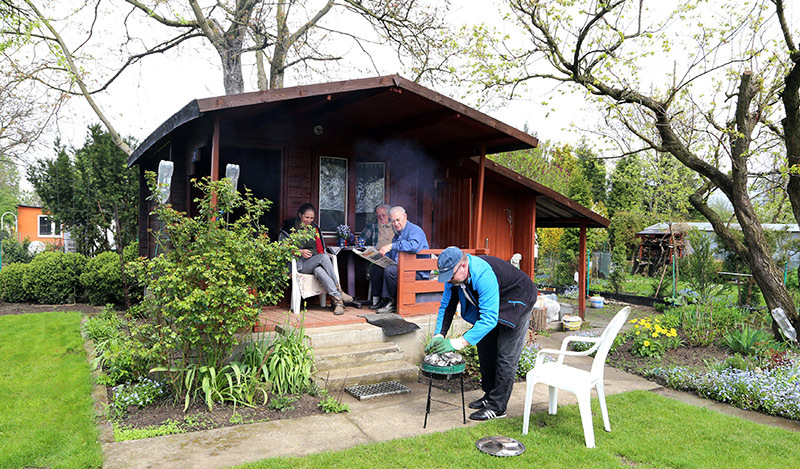 Others fulfil their socialising needs – many garden areas have cultural common-rooms and various hobby clubs, including beekeepers and pigeon fanciers. It can also be a low-budget alternative for the holidays, or raising one’s social status with a second home in an elegant area. The usual działka owner cliché is a married, retired couple, but in reality a whole array of social milieux and age groups can be found among the działka lovers. 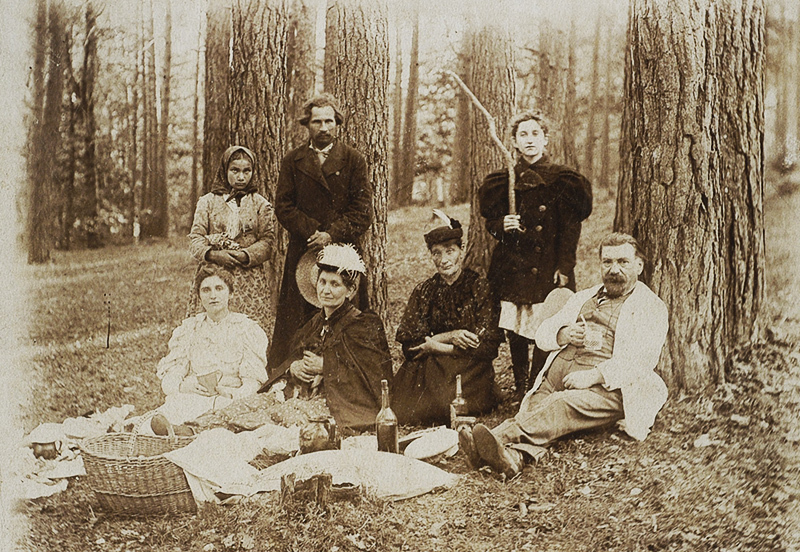 In the past years, hipsters also made their expansion onto the działka gardens. An owner’s ID card is no longer a strange artefact from the world of aunties and uncles, but rather the sign of being part of the avant-garde as an environmentally-aware consumer. After all, what could be more organic, eco-friendly, local and fair trade than carrots grown on your own piece of land? Flowerbeds present themselves beautifully on carbon-paper lifestyle magazines. Artists also became interested in the eclectic landscape, and in the summer of 2009, the Le Guern gallery moved its headquarters to the Siekierki urban garden area. A biennale was organised, with 49 little huts transformed into ‘national pavilions’.